Bye bye, blogger. I got myself some web space, and decided I wanted to host my blog myself, and blogger isn't working properly with not-blogspot, so I'm giving Wordpress a try. It has a neat feature that imported all my old posts and comments... Anyway, update your links; I'm here now. Now go produce some more first-rate comic books, movies, and (please?) TV series. Once upon a time, there was a guy named Andy who liked to eat candy. His best friend was Sandy. And he and Sandy found it handy to steal candy from Walmart. The end. That was a fiction, so I was doing something different from telling you something I know; you misunderstand me if you treat my story as testimony and form all these beliefs about Andy and Sandy. But you can understand what it would be like if I were really making assertions about what I know about; you can make judgments about what would be true if (what is true in the nearest possible worlds in which) my story were a piece of true non-fiction, instead of a fiction. On Lewis's view, that's what's true in the fiction. There have been lots of good criticisms of this view -- I think this may be a new one. Suppose that in fact, just by coincidence, all the sentences that make up my story happen to be true. There really is some guy, maybe in South Dakota, whose name is Andy, etc. His mother works as a substitute teacher. I, the story-teller, have never even heard of this guy; I'm just making up a fiction. Now, what is the implication of Lewis's view? Consider the nearest worlds in which I'm telling the story as known fact. Well, there are two candidate classes of worlds -- worlds in which I know about the guy in South Dakota and am talking about him, and worlds in which I know about some additional person who meets the description. It seems very plausible that the former worlds are the closer ones; in the latter worlds, we need an additional person named Andy who likes Candy and steals from Walmart with Sandy. So in the closest worlds in which I know the story, I'm talking about this guy in South Dakota. So, it's true in the fiction that Andy lives in South Dakota, that his mother is a substitute teacher, etc. This is intuitively wrong; whether there's some guy satisfying my story who is nevertheless causally isolated from me has no bearing on what is true in my fiction; to learn what is true in the fiction, we need not investigate whether anyone satisfies it in the actual world. 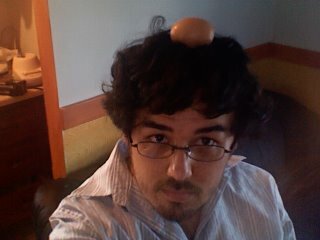 Is it possible to balance an egg on your head? That's the question of the hour over here. Shari pointed to the discussion, because it's amusing. My first reaction was, "that doesn't sound very hard". So I tried it. I was right. It all started with Revelation 13:18 in the Bible: "This calls for wisdom: let him who has understanding reckon the number of the beast, for it is a human number, its number is six hundred and sixty-six." The beast is also known as the Antichrist, according to some apocalyptic theories. I didn't realize that apolcalyptic theorists were the relevant experts on semantics. If I'd been researching this article, I would have consulted linguists or dictionaries to verify the claim that the beast is also known as the Antichrist. The "some apocalypic theories" bit seems a little misleading, too -- are there apocalyptic theories that deny that the beast is also known as the Antichrist? Such theories, if there are any, seem to be empirically inadequate; they make false linguistic predictions. But I guess these are empirical questions. I shouldn't try to settle them from the armchair. I guess I'll go back to my paper on the epistemology of conditionals. IFILL: Before we go tonight, a different way of looking at the so-called Red State-Blue State divide. Perhaps you've heard of the gender gap. Well, our partners at National Journal have discovered, after an in-depth investigation, the caffeine gap. It goes this way: If Blue States are home to Democrats and Red States to Republicans, Starbucks may provide the key to the next election. It turns out there are nearly 4,800 Starbucks coffee shops in Blue States but only 3,200 in Red States. On a per-capita basis, that gives Democratic coffee drinkers nearly twice as many chances to snag a Frappuccino than Republicans get. The Red State with the most coffee shops? Arizona. Maybe that explains John McCain. Media Matters doesn't provide analysis here -- they just point out that this was said. But I don't see anything obviously false or offensive or conservatively biased about it. It just seems kinda funny. What am I missing?